By Zack Quaintance — Stan Lee died today at the age of 95, having helped create and—perhaps more importantly—entrench in the culture nearly a dozen comic book superheroes among the most famous fictional characters on the planet today. I never met Stan Lee, nor do I have anything all that pressing to add to today’s conversations about his legacy or passing. I do, however, have my own experiences with the man as an icon as well as with his work, and in the interest of shared grief and mourning, I’d like to share those with all of you now. 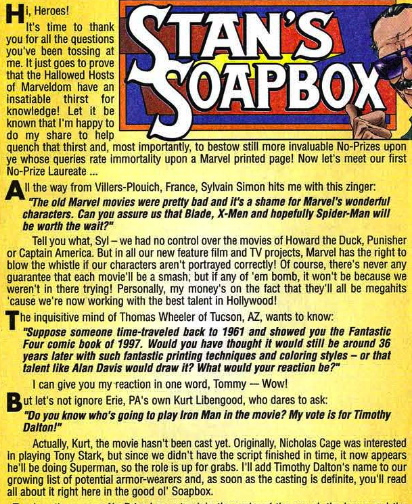 My own first experience with Stan Lee as a personality was likely in the page’s of a Marvel comic book I bought (or had bought for me by my mom) in the mid-90s, a random issue of Uncanny X-Men or Amazing Spider-Man, in which his old Stan’s Soapbox column still ran. It had a little cartoon version of Stan at the top, smiling with his dark glasses and big mustache at the reader as his alliterative enthusiastic text took hold below. It started with Hi, Heroes! Or, Hi, True Believers! Always. And it ended, of course, with Excelsior! I read every word, at least twice. That was just how I consumed comics in those early days, keeping them stacked in a shoebox beside my bed. Stan Lee, I soon noticed, was the same name that presented these stories at the start of the issues, the same name listed as the characters’ co-creator. I intrinsically knew he must be important, the boss of this whole shebang. I knew it in the way that you can only ascertain certain knowledge as a youth, some mix of naive assumption and osmosis special to kids. And while I didn’t quite realize this at the time, there was something in Stan’s attitude and writing (even if he wasn’t always doing the column himself by then) that made me feel included, part of a special secret, that made me feel less alone. And more than creativity or marketing or vision, I think that was Stan’s real gift, the ability to unite disparate folks under a banner of shared enthusiasm and positivity. Indeed, the characters Stan helped create, mold, and spread were often bearers of important and formative ethos—with great power, comes great responsibility, or discriminating against those different than you is a path toward compounding hate—foundational lessons for us all, to be sure. It was, however, Stan’s relentless enthusiasm that would shape my character more directly, lingering with me as I developed my own approach to consuming and creating media as I aged. Even today as I interact with friends and strangers online, discussing movies, books, comics, or life, I often ask myself how Stan might respond, and that little exercise does wonders to inform my tone. Now, I realize I’m framing this all a bit solipsistically, and that many others—indeed, much of 1960s culture—feel the same way, perhaps with more direct and concrete examples of how Stan Lee and his creations informed their lives. I know too that his legacy is likely to be a complex one, controversial. I’m not here to discuss that, not even a little bit, certainly not today. Today I only want to talk about how this loss feels, independent of the contrarian or analytical. Stan Lee is gone now and it hurts. There’s an old writing adage that says the invisible last line of any and all stories is and nothing was ever the same again...in my career I’ve done journalism and I’ve written short fiction, going back now about a decade, and I’m starting to write comic books too (hopefully with greater frequency soon). I always think about that invisible last line as I head toward endings. Because of Stan, though, I often tack on an addendum...and nothing was ever the same again. Excelsior! R.I.P., Mr. Lee, and thank you for all that you created, all that you built, all that you’ve left to make us better. Stan’s major success came relatively late in life, with Fantastic Four #1 publishing when he was roughly 39. Stan had serious literary ambitions, but he still put his all into comics, for the most part, using the medium as an outlet for real art. Stan was as interested in public speaking as he was in writing, seeing the intrinsic connection between the two. His positivity, his positivity, his positivity.